At Mapleridge Children and Adult Dentistry, we’re happy to simplify your family’s dental scheduling by making it easy to make your dentist your child’s dentist. You don’t have to worry about finding another office when you need kids dentistry in Liverpool if you’re already a patient, and if you’re not, we can take your whole family instead of making you schedule appointments at one office for adults and another for kids. It’s convenient, and it makes access to family dentistry in Liverpool, NY, that much easier. 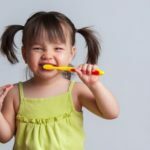 Answers to questions you have about developmental oral hygiene during teething and early childhood. Instruction for you and your child about brushing, flossing, and other important aspects of maintaining a healthy smile. The visit builds familiarity with the dentist’s office, making it an easier place for a child to feel comfortable. Your initial exam includes a check-up for signs of early tooth decay and other problems that can set in during toddlerhood, making early treatment easier. Since it’s easy to predict when your child will need that first dental visit, it’s a good idea to schedule your appointment for child dentistry in Liverpool, NY, as far in advance as you are able. That way, you can pick a convenient time for you and your child, making it easy to keep your schedule consistent and meet other commitments. Contact us today for an appointment time and let us help your whole family develop healthy smiles that last a lifetime.